This moment the whole Europe is watching Greece, holding her breath. A possible “YES” will definitely satisfy the creditors and the European establishment but it will also keep the whole Europe chained in a constant recession, austerity and more economic disasters in the horizon. A possible “NO” vote will be welcome from most of the Europeans who want to escape from economic dogmas that keep them away from any kind of progress and growth. This is the result of the troika and the government of Mr Antonis Samaras who is representing the “YES” vote in Greece but in true in cooperation with the European establishment he is trying a political coup. However, while the Greek people suffered for “their own good” and the measures proved to be a total disaster, the debt – instead of decreasing – increased dramatically. Now it is impossible to repay it. In 2009 when the crisis started, the Greek debt was 112.9 percent of the GDP, by the end of 2014 it was 175.1 percent. In euros, the Greek debt was 263.28 billion euros in 2009, and it reached 375.17 billion euros by 2014 and still climbing, daily (source: Eurostat). In the meantime growth in Greece fell under 0 percent, without any immediate hope to rise if the recession and the austerity measures continue. It is also noticeable that the Greek debt, in real money, was and still is, ridiculous next to the Italian, French or even the German foreign debt, not to mention the US debt, which is vertiginous by any standards. The Troika’s and EU’s failure to help Greece was tremendous and the IMF was eventually forced to admit it even though it never tried to change anything. Actually yesterday and supposedly under the pressure of the US congress, IMF was forced to publicize a report that explains all that adding that without a strong cut, over 30% and the same time a big financial help Greece is doomed. Why they said it now? First of all as it has become known they were strong pressures form the European governments and especially the German to cover it (and they have for sometime) for the simple reason they didn’t want to acknowledge responsibility and perhaps influence the Greek’s reaction in the referendum. But there was also another agenda which more evil. The IMF profited more than 4 billion euros in interests the same period from Greece. The same applies with all the friends, allies and partners in Europe. Germany only profited 40.9 billion euros from the Greek crisis in 2010-2013 – in interest alone – 11% of the Greek debt as it is today. And then it was just politics. Pure revengeful petty politics. Europe this moment is governed by conservative, far-right and social-democratic parties who hate to see a leftish prime minster from a tiny country in the south prove that they were wrong in everything they did. Prove that even the policies they practiced in their own country are wrong. So out of egoism and political agendas they punish 12,000,000 human beings. They actually consider suicides and unemployment as collateral loses on the way for the euro-stability. These were the arguments during the pro-referendum days. Less people died in Yugoslavia during the civil war and nobody thought of them as collateral loses, not to mention the British demonstrations and the American tears for the loses during the Iraq and Afghanistan war. In Greece the EU establishment saw them as collateral loses. I’m sorry but in my dictionary this is called genocide. But who cares what am I saying? As the director of the IMF, Mrs Lagarde said, if the people vote ”NO” we will consider the result illegal and let Greece bankrupt, if they vote “YES” and overthrow Tsipras – the newly elected Greek PM – then we will come in an agreement with them. With her agreed and emphasized with more threats Mr Jean-Claude Juncker, the president of the European Commission, Martin Schulz, the president of the European Parliament, Jeroen Dijsselbloem from the eurogroup and of course the German economic minister and representative of the Merkelism dogma, Mr Wolfgang Schäuble. These are insults, not only for the Greek people but for every single democrat everywhere in the world. They also show the arrogance of the money oligarchy that governs the European continent this moment in violation of the European principals that are based in democracy and solidarity. The referendum of July 5th in Greece is not about a currency, it is not about a small country with a huge debt; it is about democracy and this is why it is important for every European, for every citizen of this world wherever they live. 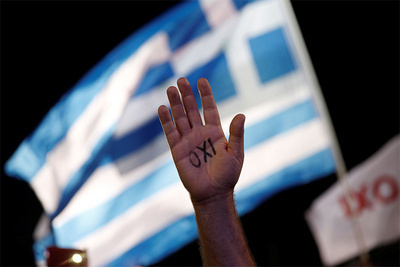 If Greece falls, who is the next? No has won and this is what Paul Krugman, a Nobel prize in economics and New York Time columnist had to say about it: "we have just witnessed Greece stand up to a truly vile campaign of bullying and intimidation, an attempt to scare the Greek public, not just into accepting creditor demands, but into getting rid of their government. It was a shameful moment in modern European history, and would have set a truly ugly precedent if it had succeeded." Indeed, what really won was Democracy, the original gift to Europe from the Greek people. Germans are shysters, always were, always will be. Greece lives in the hearts of everyone around the entire world. Beautiful literature, beautiful people, beautiful seas, the creators of democracy, the lovers and defenders of God. I feel sorry for Germany! What will that dark country ever be remembered for? Beer and genocide!